Can you tell what kind of wood is hiding under here...? All Gambit Boards (so far!) are made out of solid wood - but solid wood as it turns out is not cheap! Yesterday, I went into a local retailer to find some teak boards as a price comparison, and was shocked to find that teak planks suitable for Gambit production are $62 per board foot (and each board is two board feet)! Plus, the boards they had at this particular store were more hockey stick than straight stock. So, we've been increasingly creative in our approach to sourcing our blank planks. First off, our primary source of wood is known as 'beetle-kill pine'. This is BC wood that suffered pine beetle infestation, which does two things to the wood: makes it less desireable for construction; and, marks the grain with some amazing denim blue patterns. Some blanks work out well as Gambit6s. Some have to be trimmed down to Gambit4s because they've taken damage on the side, or a knot flew out of the board while were drilling it out, but every board we buy gets used. In this way, we are helping create a market for this material, and by doing so we are contributing in a small way towards encouraging logging companies to harvest and mill this wood instead of leaving the trees dead and rotting and becoming forest fire hazards. 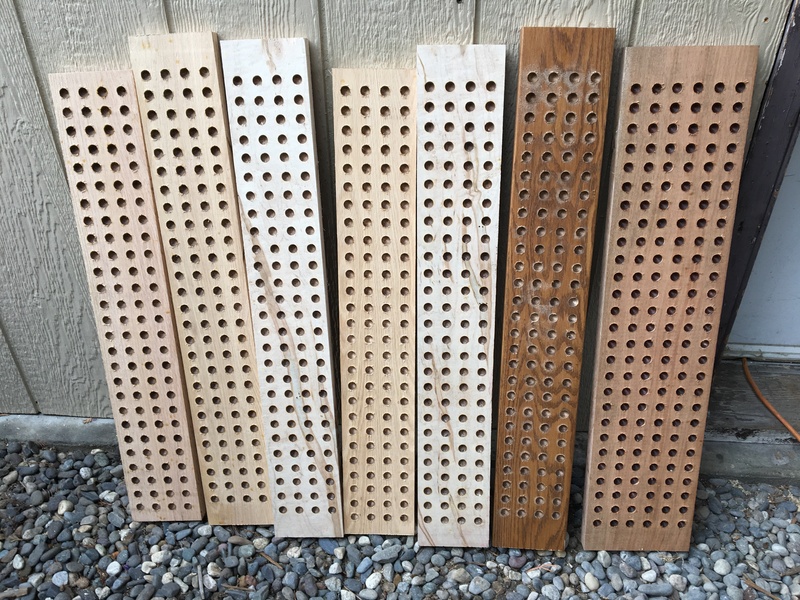 These boards drill out and stain up beautifully with a single coat, and the patterns are all unique. For our 'premium-species' boards, we are always on the lookout for solid wood in any species - we've done Gambit Boards in cedar, oak, cherry, mahogany, maple and even teak. But we're not paying the prices they're asking in stores for these boards! 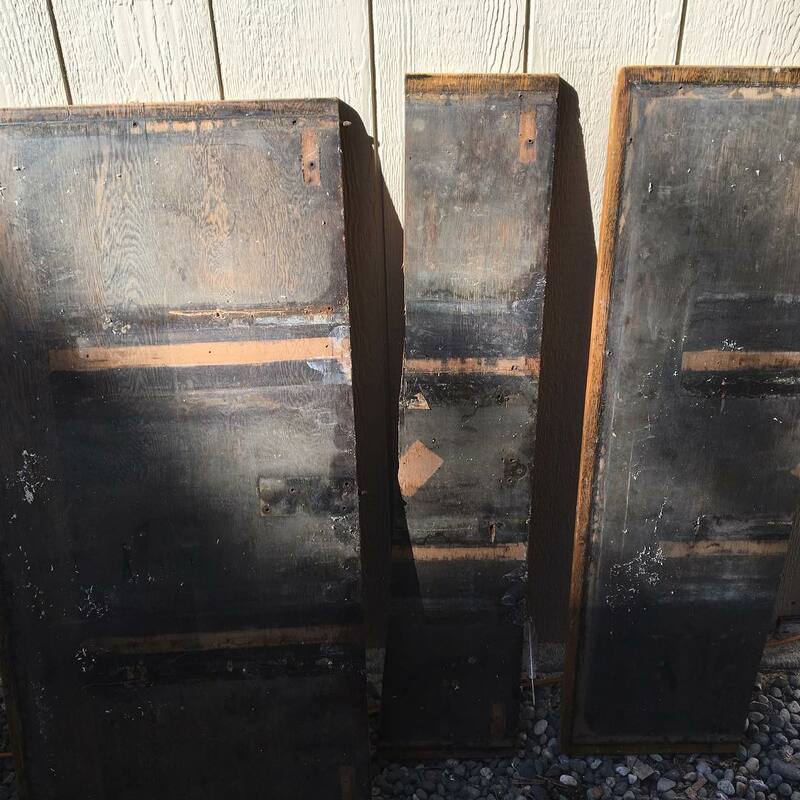 Instead, we track down broken furniture, renovation boards, even leftover solid wood flooring, and create our game boards for you from these items marked for disposal. In this way we are upcycling perfectly good wood that has lost its original purpose, and giving it new life in your home as our family-friendly strategy game. This is how we can offer limited edition premium wood editions of Gambit without them costing literally hundreds of dollars more for some species! If you have a piece of solid wood furniture that is beyond repair, and would like to talk to us about turning your piece into a Gambit Board for your family, get in touch with us and we'll make those arrangements. We love to turn what once was old into something new again! A variety of wood species getting ready for sanding and stain. ← School kids loving Gambit!